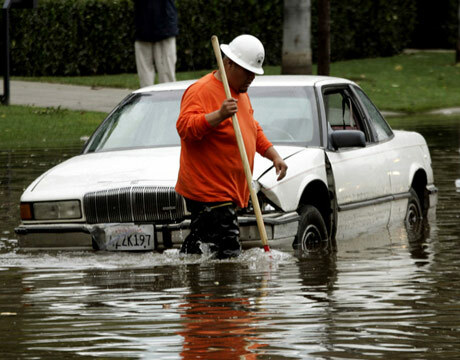 Los Angeles, CA (Obama.net) – Torrential rains pounded the state of California over the weekend and forecasters are predicting even more rain is on the way. A winter storm dropped 7 inches of rain in the Los Angeles area over the weekend causing flooding, mudslides and numerous road closures Monday. To make matters worse, an additional 3 inches of rain is being forecasted for the area through Wednesday, increasing the chances of more mudslides and flash floods. All of the rain that fell over the weekend obliterated rainfall records while also causing countless traffic accidents, downed trees and the cancellation of some horse racing events. Forecasters are predicting some local areas may see as much as 20 inches of rain during this first portion of the storm. After a couple day break, the winter weather is expected to return to the Los Angeles area late on Christmas Day bringing even more rain to the area. The potent weather system hit the state on Friday after a large storm front coming out of the Gulf of Alaska met up with a subtropical, moist air coming off the Pacific Ocean. These two weather systems have created a several day period where record rainfall as fallen in parts of Los Angeles County. As much as 3 to 4 inches have already fallen in downtown L.A., Hollywood and San Fernando Valley. Some of the mountain areas have received as much as 7 inches to date. The rain has been so torrential that it has smashed local records. During the three days of this storm, Pasadena has seen 3.45 inches of rain, which is more than double the previous record of 1.5 inches set back in 1987. The biggest concern with this type of weather is flash flooding and mudslides. The Santa Maria River briefly overran its banks on Sunday forcing a number of people to evacuate their homes in Guadelupe, which is located in Santa Barbara County. Flash-flood warnings remain in effect for several areas, particularly the mountain areas still scarred by recent wildfires which are ripe for mudslides. Update: Huge storm in Southern California expected on Monday.